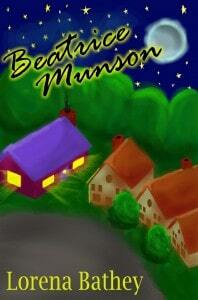 Beatrice Munson could be compared to Mary Poppins, but for adults. She has this charm and energy that is almost like magic as she changes the world around her. No one in the neighborhood is safe from her influence, which I found refreshing and a bit unrealistic. It just happened really quickly. The book opens with Marissa spying through her window trying to get a glimpse of Beatrice, the girl that she hated in high school, and when she can’t she bakes some cupcakes to take over to Beatrice’s house. Within seconds of seeing her, Marissa is swept up in her charm and Marissa’s opinion is instantly changed. This was hard to swallow. It’s been eleven years since I graduated from high school yet I still feel some grudges towards some of the events that took place and I don’t think seeing someone involved with it for a few minutes would just make that disappear. I do like the idea that Marissa is able to move past her frustrations and accept, even adore, this woman in her life. It’s something I think we should all aspire to do, I just don’t think it would happen so fast. The formatting was very frustrating. The author didn’t justify the text which was distracting and there were some spelling and grammar errors throughout, but I enjoyed the meat of the story. I liked the idea of picking up the dreams that get left on the curb as we enter motherhood and finally seeing them through. I think it’s important for women, especially mothers, to create a hobby or skill that is just theirs. I wish the characters had been a little bit more developed. There was a lack of consistency with them. For example, when Marissa starts dating someone she wants to take it slow because she doesn’t want to follow her pattern of falling in love too fast and jumping into bed, but then later she says she needs to date other men to compare because she doesn’t have much experience with dating other than with her ex-husband. Which is it? You can’t have a pattern unless it’s been repeated multiple times, so did she date a lot or does she have little experience? There are things like this speckled throughout the book. The ending was the best part. I cried, which is always a good sign for me, as it shows me I’ve become invested in the characters. Marissa was my least favorite, but I did enjoy Beatrice and the neighbor, Diedre. I would love to have someone like either of those two living next door to me. It sure would make life interesting. Thank you Kimmel for your review. I love when readers give me honest insight because that always improves my writing! Glad you loved Beatrice…she seems to evoke the grownup Mary Poppins feeling for many.